World’s one of the most intensive & unique, training workshop based on thousands of years old Vedic & Tibetan SOUND healing science to heal several kinds of Critical Physical, Mental, Emotional Disorders as well as for Spiritual enlightenment. This training workshop features some of the world’s most powerful Sound healing techniques & amazingly powerful SOUND Healing tools i.e. IASH Master Chakra Set of Singing Bowls, IASH Ancient Healing Set of Singing Bowls, IASH Energy Meridian Singing Bowl, based on ancient Vedic & Tibetan Sound healing science to heal & help people with wide range of critical physical, mental & Psychological disorders. Medical Doctors, Health Care Professionals, Deep Meditation & Yoga Practitioners, Spiritual seekers, Massage Therapists, Body Worker, Energy Healers or anyone willing to have an in-depth learning experience with the infinite healing powers of sound. 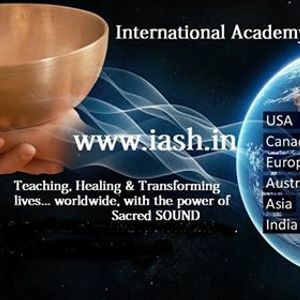 IASH Certified Advanced Level-1 / Professional Level -1 Practitioners / Highly qualified & Experienced Alternative therapists / Deep meditation practitioner / Medical Doctors Etc. Workshop Contribution includes Training, Course Material & Lunch during Workshop.